Ensure efficiency in order taking and accurate accounting at the end of each meal, with this Choice 2 part carbonless guest check! Part 1 of this white guest check features subtle green shading within the order area for an easily-identifiable writing space and pleasing contrast. Navy blue print makes this check easy to read for staff and patrons alike, and 17 lines ensure ample room for guests' orders. Menu prompts at the top of the front of each check facilitate faster service and fewer errors. For a fraction of the price we choose to order here. The books are of great quality and wrote through on the 2nd page great. No complaints from us! 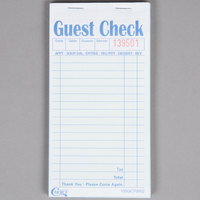 The choice 2 part green and white carbon less guest check book is a good product. The books are a nice size, have a firm surface to write on and they transfer well to the bottom check. This is a great product for the restaurant business and definitely a great low price. When you have a restaurant. Checks are something important and these duplicates sure do come in handy. Awesome product. This is your standard green and white guest check book. It is really nice and well made. And it is so much cheaper than what we were paying. Perfect guest check book for our wait staff in our french restaurant. Easy to use and the price is good. The two colors make it easier : one for the wait staff, one for the kitchen. Really like these guest checks, it rips off and writes on nicely that it shows really good on the yellow slip for the kitchen, so they can see clearly what you wrote. Good quality and good price for 50 of them. These books do a great job making us look professional and keeping track of orders. Our sandwich counter would not run half as smoothly without them. Same quality at the overpriced books from the food company. Books are carbonless meaninh tge copy goes to the next page. Save money buying these! Excellent choice! Thank you! This is the same checkbook that we got in the store for a fraction of the cost. I paid a lot more for 500 checks at our supplier and you can get 4 extra at the same price here. I prefer carbonless for the ease of use. You seriously get your money’s worth with the order pads. They cost twice as much every where else I’ve tried to buy them. I will buy again. Nice quality product that the staff loves! Easy to use, durable, and a great price. We buy these items for all three of our restaurants! We started purchasing these guest check books from Webstaurant because they have the absolute BEST price around compared to all the other web based companies that sell paper products. These guess check books are used by our waitresses. They are easy to use and they love them. The books are just small but big enough for our orders. These guest checks are great for breakfast orders or as notepads for our servers. The price is great too! We will definitely be buying these again. These Guest Check Books work Well. My servers prefer just a notepad though. These check books have are the ones where you write something and it copies it onto the next sheet of paper. These guest checks are great for our staff! We love the two parts, the carbonless works great, and the price is great. Will definitely reorder. We’ve been using the space for over 25 years and they’re great we’ve just recently switched over to a POS system and I still order these pads just because they’re great to have around . I have reordered this product numerous times. the quality is outstanding and the ink wont leak through the other papers and ruin them. The pages are easy to tear so there is no hassle in tearing out the pages. Great price value for the 50 case guest check. Good paper quality and weight, plan to reorder when we need more in the future. Fast free shipping as well with prime as well. WISH I WOULD have GOT THESE A LONG TIME AGO! THESE ARE MUCH BETTER THANK THE GUEST INKS. THIS ONE IS FOR DURABLE AND NOT FLIMSY. WILL ORDER AGAIN! Love these guest checks. The carbon copy comes out so legible and there is plenty of room for the waitstaff to get their orders in. I have used other brands but I have found the carbon copy barely comes through causing havoc in the kitchen, I will never buy any other brand than Choice. This is great price and great product. The carbonless write out clear and very easy to use. There are so many price online, but this one is cheep and efficient. These Guest Check Books are easy to use. The carbonless copies are clear and easy to read which reduces confusion and help us to maintain efficiency. These are always great to have around for when you are in a pinch. We have an electronic POS but when it goes down these work great as a backup. Great product for the price. We can almost get these anywhere; however, the price is what kept us purchasing through Webstaurantstore. Highly recommend for the price and quality. We appreciated using these in our CTE restaurant. Student chefs found them convenient and easy to use. They appreciated the yellow carbon color that they would keep with them in the booklet while ripping off the green sheet to give to back of the house. One thing that is difficult for anyone to remember is to use the piece of cardboard attached to keep from having the writing run through to 3 or 4 tickets behind it. Wasteful. Wish they could be made so as to NOT bleed through to other sheets when writing. Each book has 100 sheets(50set). It has a numbers that makes easy to range by order. Most important thing, Carbonless. I used to use other guest check. Now I know the carbonless one doesn't have specific smell and no stain on your palm or finger at all. Like it. These guest checks worked out well. Good price and good quality. Just enough space for the orders to be written down. We Will use again. The 2 part check book makes it easy to take orders and give a customer the receipt without having to making a copy. They are easy to write on and tear quickly. A great buy! I've used these for crafts and different projects to help label things, although coming from a restaurant background I know they are great & helpful in that setting as well!! This is a very standard yet very useful check book. You get a 10 pack of books for one cheap price! Order these for yourself today! These guest checks are easy to write on and have plenty of lines. They are straightforward and I personally prefer a handwritten check because it's more personable. The price is right. I am glad to have found these on this website. They are great products and cost much less than our local supply. I am have been ordering from them since. This guest check is very easy to use, it is to write and rarely have any missing sequence number or wrong number. I would recommend it. Guest checks are very important to restaurants. And hard to find for a decent price and what you need. These however are perfect and a great low price. Will be ordering these only from this point on! We have ordered dozens of these cases and never had any issues. These guest checks are a pleasure to use and are packaged very well. These are great guest checks that are easy to see and use. We've recently switched over to printing our checks out through the Square system, but these come in handy for taking orders over the phone, etc. You get a lot for such a good price, so it's definitely worth it! These are great books. Very well assembled. They stay together until the very end. The duplicate check is great for us who are not using a POS system. Carbon copy easily detaches with \out tearing. Great price for a great product! Love this guest check. Table section is primarily what we use in the top row. Plenty of space to write down the order and shows through clearly on the carbon copy. We use to use the 1 part checks, but these work so much better for our business. The yellow copy goes to the kitchen, and the front copy stays with the server. These guest checks are wonderful if you're looking to have two copies of each check (one for kitchen, one for customer, for example). Price is tough to beat! This is a great product at a great price. I have reordered these already and will continue to use. The price is better than I can find anywhere else. The price and quality can't be beat. The size was a concern initially, but they work. We love these 2 parts for matching tickets on deliveries. These work perfectly for our small deli! It's great to have the second copy that way we don't lose orders or have mix ups. Would definitely recommend. Simple yet effective. These are your standard 2 part guest checks. They are perfect as they leave us with copies for both our kitchen staff and the customer. Good priced and reasonably well in quality, better than the messy carbon paper ones. Can't complain, nothing more I should say, really no complaints, really. I have been working with these little booklets for a long time. I love how they don't use the carbon page to copy, so that's a lot neater and less shuffling of pages. The copy is good for keeping with you while waiting tables, while the other page can go to the kitchen or runner if needed. They work well however I really dont like that the kitchen copy does not have a lines on it. Maybe it is just personal preference but I like the 3 copy tickets better. These 2 part guest checks are a 'MUST HAVE' for any restaurant. The second copy of the order is crucial to fulfilling food orders with minimal error since there is more than one copy for each order with more sets of eyes to check for accuracy. Definitely recommend! We were going to use a different supplier for the same product, but even with the shipping cost Webstaurant was 1/2 the price per chit. We hold onto these guest checks in the event of our Micros system failing. It is always good to have a back up of hand written checks. These two part guest checks are easy to handle for my wait staff, love that they are carbonless. They price is great for the business. These books are pretty straight forward and are of an acceptable quality. We've gone through a few cases of these in our small shop and they do the trick. This is a really good deal. The paper is kinda thin, but the servers are able to take orders and the kitchen cooks can read the orders on the copy without any problems. A great quality product. Easy to use. Its a good price point. The Carbon less copy work great. Perfect size for the pockets. We will order again. I was spending over 3 times this much on previous products and am so happy I found this product. I bought the carbonless and works just as good as my previous, more expensive products. For anyone who has a business and that places orders these tickets are a must have. I like the double copies I like that I am able to give the customer a copy of what they ordered as well makes life a little bit easier. Great Guest checks. Classic look, simple to use. They also come through to the other copy very clearly. Make sure to use the cardboard divider. Not sure when we'll use the checks since I bought as a back up in case the power goes out and we can't use the register. I believe it's a must have in any restaurant, even if they don't normally use them. You'll hope you had one when the light or wi-fi goes down. Inexpensive, and they don't have any messy carbon sheets to contend with. Transfer to the kitchen ticket is always clear and dark. These are our goto order pads. As a food truck, we do not use a POS system so these work great. You can write on the front check and give to the customer and the back page goes to our chef. The only thing I dislike is that the tickets are not sticky so we have to thumbtack each on the board. this 2 part green and white guest check is a great product. my staff and customers are very happy with the product. and I am super happy with the value. You can't beat the price on these. Way cheaper than the restaurant distributors that I order from. And you can't beat the fast and cheap shipping! Just exactly what you would expect from a 2 part order pad. Not expensive. The carbon paper works well. The pages tear our easily enough. A good product. We use these in our restaurant and they work great. We just write the customers order down and then we take it back to the kitchen, it's pretty simple. Wait staff likes the duplication, one for kitchen and they then have a copy to work off of. Works very well. Good thickness, carbonless and not messy. These are great. Our waitstaff are very happy with them. Management is very happy as well because they cost us half of what we have to pay to order them from our food supplier. We keep these on the counter for our CSRs to take orders and remember any notes they need. Works great and would highly recommend them. These guest checks are exactly as described. The carbon copy works great for the chefs use. The also have an easy tear off for guest receipts. I love these guest check books! I looked on a lot of other websites for better pricing but couldn't find a better price! I would buy these again!! Good product. Gives 2 copies which is nice for the kitchen and having one for book keeping. Definitely remember to put the cardboard in between checks before starting to write, or it will bleed through. Best price around the web and in stores. Easy no mess use without carbon paper. Get plenty of them. 2 part works great for keeping track of sales. This product guest check is definitely on the top list. It is inexpensive to buy but we often have to restock. Works great at many different types of restaurants. If I could give this order tablet a 6 stare rating I would. I love the way the order sequence is at the top so I can tell if any of my servers are being dishonest, With their customer count. Can't beat Webstaurant pricing! These do the trick and the bottom sheet is very legible. Won't regret getting these. Best prices on the web, and trust me I shop around for more than worth the time. We recently swtiched to a new process and the order slips are amazing. The price is by far the best out there and the product is top notch. I am really love them!!! They are inexpensive and very easy to use. My staffs are so happy to get rid of the messy carbon paper!!! Great deal on these Guest Checks. Have ordered them several times already and will continue to order as they are the best deal and work great! These are easy to use and do what they're intended to do. They work as intended. I am a harsh judge so I didn't give them 5 stars because most things I review don't get that many stars unless I really love it. Great checks. Lots of room to take large orders. Print goes through clearly onto carbon copy and the checks tear off straight across but easily tear off. I needed some of these and I wasn't sure where I was going to buy them from and I saw them here for the price I would have to be crazy to pass them up! These guest checks work just as good as the ones I used to get from my national food service operator. And they are a third the cost! These are great Guest Checks! They are industry standard which customers expect, the print transfers clearly onto the second sheet and the price is reasonable. These are great guest checks 50 book/case. You can not beat the price. When you are starting a business you look every where, but you can't beat WEBstaurant. Another great product from WEBstaurant. I've checked around for a better price, and even figuring in shipping, this is still the best buy. We don't have a POS system, so we need a 2-part check, and the waiters are very happy with these and the kitchen staff like them also. Thanks, WEBstaurant!